New Winter 2018: Celebrate your faithful hunting partner with a personalized dog ornament that will be a cherished favorite in years to come. 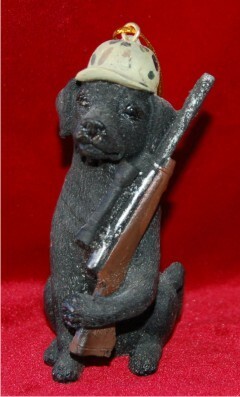 The black Labrador with gun personalized ornament features a handsomely designed dog with lifelike details and a hunting cap too. This dog ornament personalized for you or a hunting friend is customized by hand to be one of a kind. As affordable as it is good looking, the black lab hunting dog personalized Christmas ornament looks fantastic on the tree, hanging in the truck or on the wall of the cabin.